Many homeowners are aware of the benefits that spray foam insulation can bring to their home but aren't sure what the right insulation choice is. At Woods Basement Systems, Inc., we offer a wide range of spray foam insulation services, including quality materials from industry leading manufacturers. If you're having issues with your home's energy efficiency or comfort, we can help you identify the right spray foam solutions for your needs and provide a quality installation. Call us today at 1-844-204-8198 or click below to get started with a free estimate in O' Fallon, Belleville, Florissant and the nearby areas. Spray foam insulation is divided into two main categories — open-cell foam and closed-cell foam. Open-cell foam is made up of tiny bubbles that are interconnected. The bubbles hold air, which provides insulation value — typically between R-3.5 and R-4 per inch. Open-cell foam expands to fill gaps and cracks as soon as it's applied and cures into a finished product that feels like a sponge. Open-cell foam is generally used for air sealing before a different insulation material, such as cellulose insulation, is applied. Closed-cell foam is designed for large-scale application and offers a complete solution in one package. Closed-cell foam offers a higher R-value and harder finish than open-cell foam while also providing a vapor barrier and air sealing in one step. Closed-cell foam offers R-value between R-6 and R-7.1 per in. Attics: Attics are the primary source of energy loss in many homes, and spray foam insulation is the ideal solution for this space. Spray foam is applied throughout the attic walls and ceiling, providing an airtight and watertight seal while improving insulation R-value. 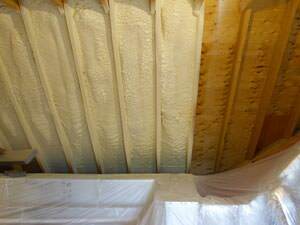 Spray foam in the attic also allows you to preserve floor space for storage. Wall Cavities: If you're doing a remodel or addition, or have new construction, spray foam is the ideal option for your walls. Spray foam can be applied throughout the wall cavity before the finished wall is installed, ensuring a durable insulation solution. Crawl Spaces & Basements: Uninsulated crawl spaces and basements often cause cold floors and rooms in the living space above. Applying spray foam insulation in between the floor joists can eliminate these problems and help keep your home more comfortable. Rim Joists: The rim joist, which is where the final joist that makes up the floor frame is connected, is a major source of air leakage. Insulating this area will help eliminate energy loss and improve efficiency. Air Sealing: Air sealing is essential to having effective insulation. Even if you choose a different insulation material than closed-cell spray foam for your full insulation, it's essential to have the space air sealed before insulation is applied for maximum performance. If you're interested in spray foam insulation for your home and aren't sure where to start, the local experts at Woods Basement Systems, Inc. can help. Our experienced professionals can evaluate your home's needs and recommend the right type of spray foam insulation for your home. Call us today at 1-844-204-8198 or contact us online to get started with a free estimate in O' Fallon, Belleville, Florissant, Decatur, Ballwin, Belleville, Champaign, St. Peters, Saint Louis and throughout the surrounding areas.